PFA-lined magnetic drive chemical process pumps at CP Pumpen’s headquarters in Zofingen, Switzerland. The PFA-lined magnetic drive pumps will support the customer in a base process. CP Pumpen’s MKPL solution will ensure the safe and reliable handling of the fluid. The PFA lined process pumps deliver a performance from 0.5 to 400 m3/h for a total head of 3 to 90 meters. They are used to handle hot and/or highly concentrated acids, bases, solvent and diffusing fluids within a temperature range of -20°C and +200°C. CP Pumpen has previously supplied magnetic drive pumps to the customer for its production process. 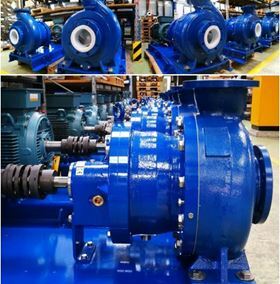 “We are proud, that our products’ quality as well as our quality as a reliable manufacturer and partner convinced our customer to realise another project with CP’s magnetic drive process pumps. It is great to see, whenever a customer is satisfied with our performance and appreciates CP’s flexibility and ability to offer the customer solutions, tailored to his needs,” said Heinz Mathys, Senior Sales and Business Development at CP Pumpen. This project is one of a number that CP Pumpen and its long-standing partner in Benelux Gielink Pump & Sampling Systems have successfully realised. The Swiss pump manufacturer CP Pumpen AG has won an order to supply five of its magnetic drive MKP pumps to a major chemical player in Benelux.